Back on July 3 as I'm sure you heard, Stephen Harper, our Prime Minister, took communion (a no-no as a non-Catholic to begin with) and, instead of eating it right away, either kept it in his hand or put it in his pocket, wandered away and sat down without ever taking a bite. The video is pretty clear. If that was the whole story, I could just acknowledge that our Prime Minister is a) ignorant of the basic rituals of the most common religion in the country he is Prime Minister of and b) does the wrong thing under pressure, and move on. These aren't great qualities in a leader, but whatever. Harper had inexplicably gone up for Communion with something in one hand so it would have been easy enough to clarify that he had to sit down and put down what he was carrying and then consume the host properly. Or that he was unfamiliar with the Catholic ritual since he's not Catholic. Or that he was trying to shake hands with the Priest, not receive communion or whatever the true story is. "After the video clip was released, a spokesperson for the PMO said Harper was offered the wafer by a Catholic priest at the funeral, that he accepted it and then consumed it." "I think somebody running a story -- and I don't know where the responsibility lies -- somebody running an unsubstantiated story that I would stick communion bread in my pocket is really absurd, and I think it's a real, frankly, a low point, a low moment in journalism whoever is responsible for this,"
The whole thing was ridiculous. We can see the video. Whose credibility does it benefit for the PM and his office to just lie to our faces as if we were either blind or complete idiots and for the media to just report it as if the video evidence wasn't clear? Still, I let it slide until I saw this story that people actually lost their jobs for daring to point out the obvious, video supported, but embarassing truth about our PM. The CBC article says that, "The publisher and editor of the New Brunswick Telegraph-Journal are no longer with the paper after it was forced to apologize to Stephen Harper and two of its own reporters over a story about whether the prime minister took communion at the state funeral of former governor general Roméo LeBlanc." One of the reasons I generally prefer reading blogs to the corporate media when possible is that when the media is so under control that people lose their job for saying inconvenient things about the PM - even when their comments are supported by video evidence - it's pretty obvious that you can't trust what you're reading (and more to the point, what you're not reading) too much. Yeah, bloggers can be biased and unreliable but they're not (as far as I know) censored so it lets me read the opinions of people who can actually say what they think without fear and then judge for myself. It looks like Orwell might have been an optimist thinking that in order for the lie to become truth, you actually needed to first modify or destroy the video evidence showing the 'truth' to be a lie. As an aside, thinking about this story, I couldn't help but recall the incident where the National Post falsely reported that Iran was forcing religious minorities to wear coloured badges identifying their religious status. At the time Harper did not comment on this as a low point in journalism, instead noting that, "Unfortunately we’ve seen enough already from the Iranian regime to suggest that it is very capable of this kind of action." 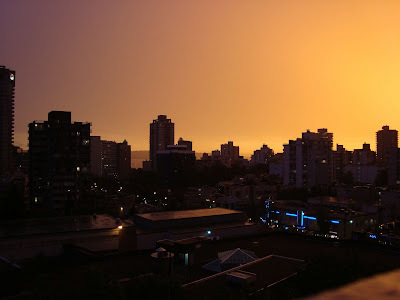 After a hot Saturday in Vancouver, a rare Vancouver thunderstorm rolled in (the best I've seen/heard in over 5 years here), complete with the sky turning a shade of orange that I've never seen before and will likely never see again. Last night Vancouver really was awesome, in the original, non-watered down, focus on 'awe' meaning of the word. Although I took a few photos and videos myself, my camera-fu is weak and they don't really capture it properly. Luckily a flickr search for 'Vancouver orange lightning' gets lots of hits from better photographers than I. Here is the best of my photos (my girlfriend's actually), but it truly doesn't do any justice to the display so you really need to click on the links. The display by mother nature was nicely timed, since there were thousands of people already out on sunset beach and surrounding area (those that braved the accompanying downpour, anyway) for the evenings fireworks. Note: This post is the twentieth in a series. Click here for the full listing of the series. This is the second of what should be a few posts on the book Morals by Agreement, by David Gauthier. In the last post, we covered chapter 2 of Morals by Agreement, where Gauthier sketched out his view of what it meant for people to behave 'rationally' in situations which didn't involve other people who might themselves be trying to act rationally and whose actions might depend on our actions and vice-versa. So in chapter 3, Gauthier extends his model of rational behaviour to cover what he refers to as 'strategic interaction' - that is situations where people are interacting with each other, rather than acting on their own. Basically, in the terms I used earlier in this series, he is moving from rational actions, to rational transactions. The formal branch of knowledge that studies transactions is Game Theory. The most famous game in Game Theory is the Prisoner's Dilemma, which I introduced earlier in the series here. For more background on game theory here is the Wikipedia entry on game theory and here is the excellent Stanford encyclopedia of philosophy entry on game theory. When it comes to game theory, examples are the way to go to gain understanding. Consider a simple game, where Harold and Kumar are trying to meet up at a local restaurant for a meal, but they are not in communication with each other. However, they both know that there are only two restaurants in town, White Castle and Black Castle. Furthermore, they know that Black Castle is closed. The best outcome is if they both meet at the White Castle (5 for both). For both Harold and Kumar, the next best option is if they go to White Castle and the other person goes to Black Castle - they don't get to meet up, but at least they can eat. For both players, the third best is to meet at Black Castle and the worst option is to go to Black Castle while the other person has gone to White Castle (alone AND hungry). C) Each person must believe her choice and expectations to be reflected in the expectations of every other person. So in the example above, Harold figures that if Kumar goes to White Castle, he (Harold) is better off going as well. But even if Kumar doesn't go to White Castle, Harold is still better off going to White Castle. So condition A sends Harold to White Castle. Condition B tells Harold that Kumar will follow a similar logic and also end up at the White Castle. The outcome where Harold and Kumar both go to White Castle is what is known in game theory as an equilibrium outcome. What this means is that, given that both Harold and Kumar are choosing to go to White Castle, there is no reason for either of them to unilaterally change their choice. Compare that with the situation where Harold is going to White Castle and Kumar is going to Black Castle - this is not an equilibrium because in this situation, Kumar would be better off to change his strategy. Now let's look at a different type of game. Consider the question of what side of the road to drive on. For now, imagine that only two people live on a road, Adam and Eve, and they need to agree on which side of the road to drive on and they both own British cars that were designed for driving on the left side of the road. Note that there are 2 equilibrium outcomes in this game, One where both drive on the left and both drive on the right. Even though both Adam and Eve are better off if they both drive on the left, if for some reason they are currently both driving on the right, neither has an incentive to unilaterally change their strategy. Only by working together could they shift from the sub-optimal equilibrium to the optimal equilibrium. Unsurprisingly, this type of game is known as a coordination game, where the coordination needed has two parts: 1) making sure that both people pick the same outcome and 2) making sure the equilibrium they end up in is the optimal one. But what if we change the game slightly so that Adam has a car that is designed to drive on the left and he has always driven on the left so strongly prefers driving on the left. Meanwhile, Eve has a car that is designed to drive on the right, but she just got her license so she is less attached to driving on one particular side. Again there are 2 equilibriums and Adam and Eve need to coordinate to make sure they drive on the same side of the road. But the situation is complicated now by the fact that Adam prefers the 'drive on the left' equilibrium and Eve prefers the 'drive on the right' equilibrium. This now becomes a bargaining problem, one that has been much studied and argued over in the history of game theory. The reason I bring it up here is because Gauthier himself brings it up in chapter 3 - because it will be useful to him later on in the book. Finally, I won't go over the Prisoner's Dilemma again, but it is worth noting (as Gauthier does) that in the Prisoner's Dilemma, the equilibrium that Gauthier's rules for rational behavior lead to is different from the (Pareto) optimal outcome. In other words, if people pursue their own utility maximization it will lead to sub-optimal outcomes where there are possibilities to make people better off without making anyone worse off, but these possibilties are placed out of reach by people's self-interested behaviour. Gauthier will argue that morality consists of the constraints necessary to generate optimal outcomes for 'rational' people. Every now and then I run across some economic forecast from 2006/2007. They are almost always amusing, and a good reminder not to take any of the current prognostications about the economy (in either direction) too seriously. "It is evident that around the world there has been a general trend towards consumers carrying more debt. This is partly a reflection of a sustained low inflation and interest rate environment. However, the accumulation of debt has largely been a rational decision, which is why repeated fears of a consumer-led financial crisis have proven unfounded." Oops. Maybe not so rational after all. People often seem to confuse the fact that something hasn't happened yet, with an argument that it won't or can't happen. I am thankful for the fact that Canada has more than 2 parties, so that if one party takes a marginal, extreme viewpoint (like the Conservatives saying that Global Warming isn't a serious issue in the last election campaign), then that is at least partly reflected by the fact that there are 3 other parties that disagree with them. Also, the presence of at least 3 parties in most of Canada makes possible the practice of moderation, something which Ontarians are discovering the value of after swinging first one way and then the other, but something which isn't even an option for folks in B.C. on many issues. Note: I'm going through and adding labels and fixing grammatical errors in my old posts (until I get bored and move on to another project). I figure while I'm at it, I should do some spring cleaning (ok, I'm a little behind schedule) on some of my draft posts that I never finished - what follows is the oldest draft post that remains in the draft folder, it was originally drafted on November 17, 2004 (any comments that I add today as I post will be marked with (ed: ...). Lots of comments these days about what should be done with the Federal Government's surplus. Now, there are a number of arguments that can be made about whether the money should go to debt reduction or not. Arguments about intergenerational fairness, preparing for future economic shocks/rate changes, the impact of the debt on the economy/interest rates and a whole bunch more. To keep things simple, I'm going to assume that every year will be like this one: a $9 billion dollar surplus and an effective interest rate on federal debt of (roughly) 5%. Under option 1, the amount we have to spend will be $9 billion this year, $9 billion next year, $9 billion the year after that and so on. Simple. Under option 2, we spend $0 this year, $9.45 billion next year (because we are no longer paying 5% interest on $9 billion we payed off in year 1: $9 billion x 5% = $450 million), and then $9.45 billion the next year and so on. Clearly, over time we will end up spending more money under option 2 (after 20 years) but to make a proper comparison, we need to consider the time value of money -i.e. that money spent now is worth more than money spent in the future. If $1.00 spent this year is worth more to us than $1.05 spent next year, than we can get more value by spending the surplus now. So the government should only spend on those items which will gain a greater than 5% return (in revenue to the government)**. My own opinion is that few options for government spending or tax cuts will yield the same return as paying down debt, a return which has the benefit of being nearly guaranteed. If you don't feel like reading it, I'll save you the trouble (ed: especially since that page is long gone, and you don't need to register to look at the Star's website anymore!). Basically, anyone you can think of with any involvement in politics in Canada thinks that the money should go their cause/constituency/whatever and nobody thinks the full amount should go to debt reduction. Quelle surprise. 2) People are impatient - i.e. they'd rather have a $10 bill today then a $20 tomorrow (this just means they apply a high discount rate to their consumption). 3) Collective action problems - the various groups figure that if they don't make their case heard the government will give the money to the other side. They could get around this by framing their comments as 'The government should use this money for debt reduction but if it doesn't then it should go to our cause' but maybe that is too long/complicated a message for the sound-bite media. to start (or finance) an experimental high tech firm, we would want a better than 5% rate of return to justify the investment because of the increased risk. "CALM - A state of emotion which is overrated except in religious retreats. It is used principally to control people who are dissatisfied with the way those in authority are doing their jobs. When individuals show annoyance, the person in power or with privileged information or expertise will make them feel they are not calm enough to deal with the situation rationally. A lack of calm suggests a lack of courage, intelligence or professionalism. The Captain of the Titanic was no doubt pleased that his male passengers in first class remained calm as they waited to drown. Had they been less controlled, they might have found some small satisfaction in passing their time by throwing him overboard"
If you follow the financial news, you'll have heard that the largest investment bank in the U.S., Goldman Sachs, has reported a profit of $3.44 billion dollars for the quarter, and said it had set aside $6.65 billion for pay and bonuses in the quarter ($226,000 per employee, on average). In a different era, just the 'mere' fact alone of a company paying its employees a quarter of million each for 3 months of work while the rest of the country faces the highest levels of unemployment and wage cuts in living memory might be enough to stir outrage. These days however, it takes this profit coming on the heels of a series of government bailouts of Goldman Sachs, as well as a series of unseemly regulatory changes favouring Goldman Sachs, combined with the fact that seemingly all of the important political players who created the bailouts for Goldman Sachs and changed the regulatory rules to suit them are themselves former Goldman Sachs employees, finally combined further with the products that Goldman sells being a prime cause of the current economic crisis all put together with sky high profits and bonusses, to generate some outrage, some lack of calm from the passengers on the economic ship. So on the Goldman front, we have a long article from Matt Taibbi in Rolling Stone, which starts by referring to Goldman Sachs (known as 'Government Sachs due to the fact that everyone important in financial matters in the U.S. government used to work for them) as "is a great vampire squid wrapped around the face of humanity, relentlessly jamming its blood funnel into anything that smells like money." Then a youtube clip from a French network business TV show with Max Keiser repeatedly referring to Goldman Sachs as 'scum' who should be 'in the Hague'. "The American economy remains in dire straits, with one worker in six unemployed or underemployed. Yet Goldman Sachs just reported record quarterly profits — and it’s preparing to hand out huge bonuses, comparable to what it was paying before the crisis. What does this contrast tell us? Second, it shows that Wall Street’s bad habits — above all, the system of compensation that helped cause the financial crisis — have not gone away." ...what [Goldman Sachs] does is bad for America. What it does is bad for America. Not "some of what it does is bad for America". Not "the legal, profit-seeking behaviour of large investment banks may have some negative externalities that should be addressed by government regulators, in the following ways". This is no way to have a policy discussion." Let me repeat part of the quote from John Ralston Saul that I started with, "the person in power or with privileged information or expertise will make them feel they are not calm enough to deal with the situation rationally." "Is there room for outrage? I always find this frustrating in economic technocratic talk, where outrage/disgust/shaming is dampened by having to focus in terms of 'bad incentives.' There’s a schizophrenia in the way we talk about this, that capitalism on one hand is a benevolent invisible hand guiding us all together, and also amoral tiger who of course was going to rip your throat out if you don’t lock its cage properly. Getting a little hyperbolic, it’s like someone has broken into our house and is looting everything in sight. How do we 'set up his incentives' so that he leaves without the treasury in tow? Setting up the terms for discourse in economic rationality speak is only going to allow us to answer the question of 'why didn’t we lock the door?' Good question, of course. But we have problems right now that rightfully deserve shock and anger." In case it's not obvious, I agree. I often find myself resigned when thinking about the dominance of our politics and economics by a wealth-serving ideology that hides under a cover of technocratic 'rationality', but the appropriate, and more effective response is often anger, not resignation. A while back, British radio hosts Adam Buxton and Joe Cornish posted their satiric proposals for the theme song for the last Bond movie 'Quantum of Solace' on youtube. In the clip I've embedded, they discuss (and read aloud some of) the comments the video clip generated on youtube - something about the juxtaposition of the British accents of radio hosts Adam Buxton and Joe Cornish with the typical content of the youtube comments they read aloud is endlessly amusing to me. I'm sure Andrew will appreciate it, anyway. Note: This post is the nineteenth in a series. Click here for the full listing of the series. This is the first of what should be a few posts on the book Morals by Agreement, by David Gauthier. Basically, it is a 'contractarian' attempt to show how rational self-interested utility maximizers in the standard economic mould would find it rational to agree to set of morals, or impartial constraints upon their actions. Chapter 1 of Morals By Agreement by David Gauthier is an overview, which I'm going to skip. Instead, I'll start with chapter 2: 'Choice: Reason and Value', in which Gauthier sets out the basics of the view of the world that he is using for this book, a view that goes by the name 'rational choice theory'. "the theory of rational choice takes as primary a conception even more clearly subjective and behavioural than interest, the relation of individual preference"
The theory centres on individuals (as opposed to groups, or society as a whole) who take actions in order to achieve a certain outcome. "the theory of rational choice defines a precise measure of preference, utility, and identifies rationality with the maximization of utility. ... "the theory of rational choice implicitly identifies value with utility"
"we shall develop a set of conditions for considered preference, which must be satisfied if utility, as a measure of preference, it to be identified with value, and the maximization of utility with rationality." Utility is defined such that if a person prefers one outcome to another, the preferred outcome has greater utility. In this theory, the causation runs form preference to utility, meaning that you don't prefer one action to another because it has greater utility, one action has greater utility than another because it is preferred by you. 3) Why it is right to consider value as a subjective, relative measure. Gauthier argues that a person's preferences are not rational if they say one thing and do another because their values are confused. As long as they do what say they want to do, we can assume that their preferences as revealed by their behaviour (the way that economists measure preference, typically) and their preferences as revealed by what they say, are in alignment, and rational (where rational means maximizing utility, and utility is maximized by doing what you prefer to do). a) They might be misinformed. Someone might intend to drink a glass of wine but end up killing themselves because they didn't know the glass was poisoned. b) They might be uninformed. Someone might choose a poor wine to go with his dinner because he has not experienced the more preferable combination of wine and food before. c) Someone might agree to a proposal, only to instantly regret their impetuous agreement. Gauthier then argues that if a preference is such that is is correctly informed and considered and that the action taken aligns with a person's stated intentions, then we can treat their actions as showing a 'considered preference' and meeting the demands of rational choice. 3) People may have preferences that cause them to maximize their present utility at the cost of their future utility. Really, in my mind, these are all really the same objection, expressed in different ways, with the third expression being the clearest and most general. With that in mind, I will just repeat Gauthier's counter-argument to the consideration of prudence (i.e. not doing things you know you're going to regret later - the third point above). "To maximize on the basis of one's present preferences need not be to ignore one's future preferences; one may take an interest in one's future well-being now, preferring a satisfying life to immediate gratification. But also, one may not. Our view is that prudence is rational for those who have a considered preference for being prudent, but not for those who on full reflection do not. Our disagreement with the defender of prudence does not turn on whether future preferences are to be taken into account, but on how they are to be considered. We both agree that the unreflectively heedless person, who takes no thought about the morrow, chooses irrationally. One's considered preferences for possible outcome's of one's choices must take into account the expected outcomes on oneself. But one may choose to ignore those effects in what one does; one may choose to take no thought for the morrow. And this reflective heedlessness is not irrational on our view. The defender of prudence insists that rational choice must be directed to the maximal fulfillment of all our preferences, present and future, in so far as we are able to determine what they are. On our view, rational choice must be directed to the maximal fulfillment of our present considered preferences, where consideration extends to all future effects in so far as we may now foresee them." * Completeness – all actions can be ranked in an order of preference (indifference between two or more is possible). * Transitivity – if action a1 is preferred to a2, and action a2 is preferred to a3, then a1 is preferred to a3. Together these assumptions form the result that given a set of exhaustive and exclusive actions to choose from, an individual can rank them in terms of his preferences, and that his preferences are consistent." Once we allow uncertainty into the results of our actions, there are some more requirements for coherent preference, the most questionable of which is that people are indifferent to uncertainty. i.e. if you offer me $10 for sure, or alternatively you will flip a coin and if its heads, you'll give me $21, and if its tails I get nothing, the theory assumes that people will always take the coin-flip, since the expected return (on average) is $10.50, which beats $10. Finally, Gauthier defends his relative, subjective viewpoint. 1) A relative view in which what is 'good' or 'right' varies from person to person vs. an absolutist point of view in which what is 'good' or 'right' is the same for every person. 2) A subjective view in which the idea of 'rightness' or 'goodness' only exists in the presence of sentient beings vs. an objective view in which 'rightness' and 'goodness' are concepts that exist independently of whether there are any people around to actually act in a 'good' or 'right' way. In the objective view, the independent 'goodness' notion acts as a constraint upon the actions of the sentient beings (or ought to) whereas the subjective view sees no such independent constraint as existing. Gauthier spends a few pages defending his contention that the 'true' viewpoint is the subjective and relative one, but to be honest, it's a bit too abstract for me to grasp, let alone summarize in a blog post. Taking all this together, Gauthier note that under this rational choice framework, as long as a person's preferences are coherent (i.e. they don't prefer apples to pears, pears to peaches, and peaches to apples) and considered then we can't say that a person's preference is irrational. Even if a person preferred destroying the world to getting a bruise on their finger, that preference is still considered rational in this theory. "Value then, we take to be a measure of individual preference - subjective because it is a measure of preference and relative because it is a measure of individual preference. What is good is good ultimately because it is preferred, and it is good from the standpoint of those and only those who prefer it. ... Our concern is to demonstrate the possibility and the characteristics of a rational morality, given that value is itself subjective and relative." "Reguly: Do you regret cutting the GST now? Harper: No, not at all. Harper: No, it's ... First of all, I believe cutting all taxes is good policy, okay? I... I'm of the school that... You know, there's two schools in economics on this, one is that there are some good taxes and the other is that no taxes are good taxes. I'm in the latter category. I don't believe any taxes are good taxes. It's important to remember when we cut the full two points of the GST, the budget was still in surplus. Anyone who says we put the budget in deficit by cutting the GST is wrong. I also think cutting the GST had some important effects. I think it's important to say why it was a good policy, besides fulfilling an electoral commitment to cut the GST, um... besides being a tax cut which as I say is good in and of itself. Apparently, there are two schools of economic thought. One believes that we are better off with some sort of government. The other is explicitly anarchist. Our PM has declared himself an anarchist. The charitable interpretation is that he was simply trying to say that all taxes are the same in their appropriateness but of course this a) doesn't really match what he said very well and b) is almost equally as stupid. I'm not really posting too much on the politics these days, but I wanted to note this one down just as a marker of where we are now in our discourse on the role of government and the need to pay for it, just how far gone into childish ideology and delusion we really are when our Prime Minister says such things seriously and the only response from our media is 'good'. This post is not about the question of what the best electoral system is, or whether we should adopt proportional representation. Instead, I am assuming that part (see here for my clearest exposition on why), and considering the political question of how best to get proportional representation implemented in Canada. There have been 4 referendums on electoral reform in Canada recently and I sincerely hope that there are some academic types out there studying and analyzing this period in Canadian politics. The two B.C. referendums were on switching to a Single Transferrable Vote (STV) system, while the Ontario and P.E.I. referendums were on switching to a Mixed Member Proportional (MMP) type system. 1) The technical details are very important, so for the most part, reform is only likely to happen if the party in power wants it to happen, or if it can be politically outmaneuvered by reform forces. Even if a party is pressured into starting some sort of reform process, constant vigilance and effort will be required to make sure they do not sabotage it in some way, either deliberately or accidentally. 2) If a referendum is held for reform, the most important technical detail is the threshold for support. Reformers need to push back against the notion that countries can declare independence with a 55% vote but it takes 60% support to change the electoral system. 3) It may be better to try and turn the First Past the Post system against itself. Supporters of FPTP argue that it is good because it allows us to 'get things done' without the pesky need to get a majority vote in favour. If a political party could be persuaded to support reform as part of their platform, then they could win election with the usual 35-40% of the vote and simply implement the reform that was part of their platform. 4) Fair Vote Canada may want to emulate the tactics of the Taxpayers Federations in attempting to browbeat party leaders into signing 'pledges' to support reform during the election campaign when leverage against parties is at its peak. These sorts of political promises to at least hold a referendum on reform were key in getting reform implemented in New Zealand. 5) After the question of the need for a referendum and the threshold for a referendum, the next most important technical detail is the wording of the question. "Should British Columbia change to the BC-STV electoral system as recommended by the Citizens' Assembly on Electoral Reform? "Which electoral system should British Columbia use to elect members to the Provincial Legislative Assembly? -> The single transferrable vote electoral system (BC-STV) proposed by the Citizen's Assembly on Electoral Reform"
I believe it was the change in wording of the question which accounted for the large majority of the drop in support for reform from 58% to 38% from 2005 to 2009. I realize it is perhaps insulting to accuse at least 20% of the voting public of being so irrational as to choose an electoral system based on how the question is posed to them, but nonetheless I believe that to be the case. If true, it certainly casts doubt on the legitimacy of using referenda to decide such questions since there would be such a large percentage of the population seemingly incapable of understanding what they are being asked. I don't know what Fair Vote Canada's finances are like, but my opinion is that this type of research (which would have global applicability and thus could be coordinated through Fair Vote Org) has the best chance of producing concrete results towards achieving reform. 6) In Canada, the failure of 4 referendums in 4 years to achieve reform makes it difficult to pursue further reform in the short term. One solution may be to emulate the Conservative strategy for achieving Senate reform, and try to break the problem down into achievable 'bite-size' chunks. One advantage of instant runoff voting is that, unlike proportional representation which is typically supported by those parties which will never gain the power under the current system to implement it, instant runoff voting tends to support centrist parties which in turn tend to win elections, meaning it may be possible for reformers to ally with a centrist party which would see instant runoff voting as being in their interest which would likely guarantee passage of this reform. 6 c) Following this train of thought, it might be possible to package reform 'products' that are suitable to different parties. An agreement to support Senate Reform in return for support on Electoral Reform for Right Wing parties, a package to implement PR for parties that normally are disadvantaged by the old FPTP system, a package that includes instant runoff voting for a centrist party with rivals on either side of the left-right spectrum. 7) In terms of gaining support for reform in a referendum, having politicians in an MMP type system get elected based on party lists is a very big weakness. I don't like this aspect of MMP much myself, and I'm as strong a supporter of reform as they come. - My favourite option would be to simply take the 'best seconds,' so that if, for example, the NDP was due 5 additional seats under MMP than what it was awarded under the old FPTP system, instead of having the 5 NDP candidates pulled from a list made by NDP party members/leaders, we would simply take the 5 NDP candidates who got the highest percentage of the vote in their riding without being elected under FPTP. The primary advantage here is that it removes the party list from the equation. Secondary advantages are that it requires very little modification from the current system and that it is simple, easy to understand, and seems like a fair way to go about things. The one drawback I see is the notion that some ridings may get more MP's than others, but I think this could be mitigated a bit, and is outweighed by the positives. I imagine the electoral reform experts out there could offer more possible solutions to this dilemma. 9) On the communications front, I think that reformers can do more with electronic media. The referendums have proven that the mainstream media is implacably opposed to reform but that media is dying. In the 2005 B.C. referendum I tracked the opinions of bloggers on reform, and, as you might expect given that the more youthful, urban and informed people are the more likely they are to support reform, the bloggers who offered an opinion were overwhelmingly in favour (by a margin of 57-15, i.e. 79% support). The ideal situation would be for there to be a 'Michael Geist' of electoral reform. i.e. A blogger supporting electoral reform, that focusses on Canada and is written by someone who is respected, tireless, intelligent, read by many, candid, politically savvy, and influential. No, I don't have anyone in mind, but I think that having someone (ideally a few someones) who can serve as a go-to place for information and tactics on supporting reform as well as serving as a focussing device for directing the support of all the reformers out there can be very effective, as Geist has shown. Of course, there is no point in giving up on the MSM, as even though they are dying, they are still pretty powerful and the people they do reach tend to be the ones who vote. Meetings with editorial boards, consistent letter writing, both 'to the editor' and directly to columnists on the political beat are probably still effective tools in the battle for public opinion. 10) Still on communications, there is a need for consistent framing and messaging as well. You might notice that I almost never refer to our current outdated, outmoded, archaic, antique electoral system without inserting an adjective suggesting that it is past its best-before date. There's probably more scope for this sort of thing, both negative terms for the current system and those who support it, and motherhood-esque terms for reforms and those who support them (sadly, 'pro-choice' is taken - Americans are the experts at this sort of thing and are likely the best source of ideas in this area). 11) One last point on communication, the development of clear visuals, phrases, youtube videos, etc. that drive home key points of the reform message and counteract some of the concerns people have, should be a priority. For example, in B.C. the videos that explain STV are useful tools in both informing voters and in fighting the notion that STV is 'too complex'. This would serve to counter the idea I feel many people have that our current system is 'normal' and that any proposed reform is some sort of aberration that has never been tried before. It would also help to create an air of inevitability around the notion of reform which is also helpful, in my opinion. 12) Supporters of reform need to get behind whatever reform is offerred rather than quarreling amongst themselves or letting the perfect be the enemy of the good. Supporters of MMP in B.C. who voted against STV because they preferred MMP are stuck with FPTP for the foreseeable future. One way to avoid this problem is to follow the New Zealand example of first having a referendum to decide which reform is best, and then voting on whether to implement it or not. You may still get some people opposing reform, but I think they are less likely to do so when they know their preferred option was defeated in a referendum, as opposed to having been excluded by a citizen's assembly process or by some internal political party policy development process. I'll end this rambling post on a point of optimism for the future of reform. As I mentioned earlier, the results in B.C. and Ontario both showed the highest support for reform in the most urban ridings which also tend to be the youngest ridings. This suggests that support may rise naturally over time as the population becomes more urban and as the opponents of reform die off. There is a common expression that science 'advances funeral by funeral' and it might be the same sort of long term battle that is required to get electoral reform adopted in Canada. I'm a few days late with this, but just for completeness sake, Dr. Dawg has the details on his return. All posts on Abdelrazik here. Note: This post is the eighteenth in a series. Click here for the full listing of the series. A person who was purely self-interested might fail to be honest and might not shun the use of force and might not respect contracts, while a person who was sympathetic to others as much as they were sympathetic to themselves would likely 'go beyond' just the commercial morals into guardian morals like 'loyalty' and 'treasure honour' (and regard bargaining with someone with the same distaste that they might regard bargaining with a friend or family member). It occurred to me as I was running that what might work would be someone who was not willing to harm another by stealing from them or defrauding them, but at the same time had no interest in helping another, i.e. someone who prefers to serve their self-interest, but isn’t willing to actively harm others directly to do so in a case where hurting others is the means to improving their self-interest, rather than a side effect. After I got home and I was on the computer, I tried googling for notions of this type, and came across a description of 'Morals by Agreement' by David Gauthier – a book which was already been in my list of books to cover (sine many other works refer to it) so I moved it up to the next spot on the list.